Following the four VVSS Shermans, Hobby Boss have also released this kit of the M4A3E8 with the heavier HVSS suspension and is basically a completely new kit with the only part from the other kits is the lower hull tub and the etched fret. The kit has 198 parts in light grey plastic, a small etched fret with 14 parts and a set of vinyl T80E1 tracks plus the decal and instruction sheets. As with the other kits the overall level of detail is quite good with well defined detail and some delicate parts such as the barrel travel lock, lifting eyes, the tools and bogie detail but unfortunately there is a bit of flash evident of some parts plus a few pin marks to be dealt with. 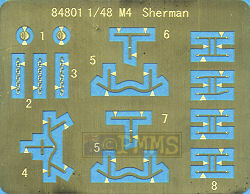 Dimensionally the kit measures out very well against the 1:48 plans in Hunnicutt’s Sherman bible for items like the hull length, width, the turret dimensions and most of the smaller components but unfortunately a few areas such as the mantlet profile and the bogies have some issues. This is the conventional plastic tub from the previous kits with detail included on the bottom and side panels with a separate rear panel, front transmission cover and sponson fillers. The transmission cover is the later single piece sharp nosed type and the contours look good but have some flash to be trimmed from the top and the fit to the hull was quite good with just some minor cleanup of the join seams required. The upper bolted flange has three locating lugs included but some trimming was needed to get a good fit and trial fitting would be advised. The fit of the rear hull panel was good and added to the rear plate are the hull side extensions and rear idler mountings plus the two exhaust outlets and the central towing pintle plus the large grill that fits under the hull overhang which has quite nice grillwork included. This kit has the later HVSS suspension bogies made up of twelve parts per bogie unit with the main bogie frame including the upper damper cylinder and oil reservoir although the height of the unit is about 1.5mm too tall. The space above and below the central springs is too great and to remedy this you can cut a section from the frame just below the spring mounts and from below the top damper attachment to lower the assembly. See the image to show the original and modified bogie unit with the dotted lines indicating the line to cut out. But of course if this is not of concern the assembly of the bogies is quite straightforward with the fit being very good, just watch the orientation of the oil reservoir which is usually to the rear of the units on the left side and to the front on the right side although I have seem photos where this is not the case. The road wheels have quite nice hub detail on both sides of the wheels and just minor mould seams to be removed from the tyre sections before assembly and look good when mounted on the bogie units. There is only one style of drive sprocket provided, the fancy smooth with nice details on both sprockets as well as bolt head details on the inside of the hubs for nicely represented drive sprockets but there is a small issue when fitting these to the final drive axle stubs. The final drives have a small pin extending out from the axle stub for the VVSS sprockets but there is no locating hole in the HVSS sprocket so it is best to just cut off the pin and fit the sprocket directly. At the back the two part idler wheel has okay detail for the scale but there is no detail on the inner wheel and to be precise there are no rim contours and the central hub is slightly too small but the wheels will suit most. The two types of return rollers are also quite nice but the rim of the larger roller is a little shallow and both have separate mounting brackets with small bolt head details included which fit neatly to the location pins on the hull sides. When fitting the bogie mounting brackets (parts L17) to the hull the top locating hole for the VVSS bogies is left exposed and you should fill this beforehand as it is easily seen after attaching the HVSS bogies. This is one large moulding including the front and side fender extensions with separate front crew hatches and separate engine deck with raised weld bead details on the hull joins and around the turret and fuel filler guards with all the smaller fittings also separate parts. As mentioned the hull width, length and 47° glacis angle are correct and all but one of the issues with the previous M4A3 hulls have been rectified here with the engine deck being the correct width and at the front the right side circular cover and weld seam behind the hatch panel are now in the correct positions although the mid hull angled contour is still 2mm too far back but considering that is the only remaining issue it is really of little concern. The only other minor issue is that the side fender extensions are about .5mm too wide but most will simply ignore this as it is really not at all noticeable and reducing the width will also remove the outer fender lip so is probably not worth the bother. The grillwork and other details on the engine deck are nicely done and there are actually two alternate engine decks, one the standard deck and the other with added brackets down the sides and you can use either depending of the vehicle you are modelling with the fit of the decks to the hull being very good. All the pioneer tools are separate parts with well done details but the moulded on tool brackets will probable also be in the etched sets to come and the rear hull mounted storage rack is quite well done along with the infantry phone box and rear fender flaps. At the front the two crew hatches are separate parts with the hinge detail revised to a more correct position as well as the recesses for the hatch hinges revised accordingly. The upper hull contours around the hatches is still too flat but there is little that can be done here to correct this without major reworking. Hobby Boss hull details with a comparison with the Dragon 1:35 kit to best illustrate the issues as per the text. Detail on the crew hatches is quite good with inner periscope mountings and very fine casting numbers included as well as a small pin mark to contend with. The separate barrel lock is very nicely done with very fine detail typified by the delicate eye under the barrel hook and looks very good while the small fender supports are a bit thick but it would be almost impossibly to mould these in scale this small and will probably be included with etched details sets to come. 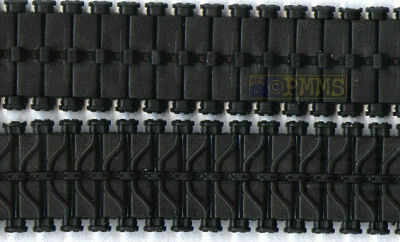 The tracks are continuous vinyl T80E1 steel chevron track and the end connectors are located correctly between track links and look quite good for the smaller scale. 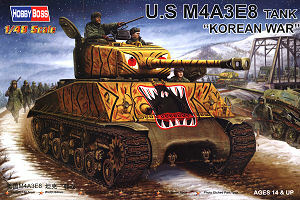 The box art actually shows T66 steel track which is a little misleading but only the T80E1 is included with this being more applicably to the Korean War in any case. The turret has the usual upper shell and lower turret ring but there is no cast surface texturing and the mating surfaces should be smoothed out a little for a better fit and there is quite a large join between the two that should be easy enough to deal with. The Commander’s cupola hatch has been revised with the outer contours more rounded but there is no inside detail at all on this hatch. The Loader’s hatch is the correct size and there is subtle hatch springs detail as well as latch detail on the inside plus a small pin mark to be removed. The mantlet has the canvas dust cover included and is quite a suburb bit of moulding with nicely rendered canvas folds and contours as well as the attachment tabs while the contour of the mantlet has been flattened a little at the front and also includes small casting numbers. Unfortunately all this good detail is compromised but the mantlet being 1.5mm too narrow which is quite noticeably when fitted to the front of the turret and is a shame as the detail on the mantlet is as good as you would see on 1:35 kits even. The single piece 76mm barrel has the later muzzle brake included which is opened up using slide mounds but this is 4mm too short in overall length as well as having quite large mould seams to be sanded off leaving a distinct oval profile. The .50cal MG included is quite nice for this scale and includes an ammo box for mounting on the hatch pintle and these is also a .30cal machine gun included which is a little chunky and you can use this in place of the .50cal as required. Again included is a small sprue with rucksacks which have quite good detail and will come up well with careful painting as well as a selection of jerry cans with strange looking embossing on the cans but with separate handles and a few wood boxes and small metal drums to add as stowage. 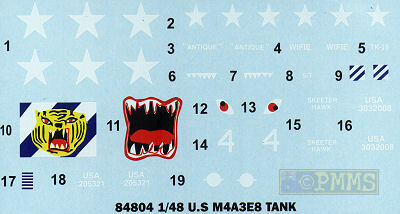 Markings are included for two Korean War Shermans with the elaborate tiger face markings applied with the sheet including the basic glacis design but one of the options will require you to hand paint the tiger stripe effect on the front of the hull and turret which will be quite an exercise to test your painting skills. Overall this kit again has some very good details and the mostly correct hull details is good to see but the kit is again let down with the dimensional problems with the mantlet and bogie units in particular but will build into a nice model if these are not of concern. It’s good to see the later HVSS Sherman in 1:48 despite the issues with other possibilities for the basic hull and suspension.